, a French poet, was born at Torigniin Lower Normandy, 1618. He was distinguished chiefly by a translation of Lucan; which, notwithstanding its inflated style, its numerous antitheses, and its various false brilliancies, continued to be long admired. It engaged attention and applause so powerfully at first, that cardinal Mazarine made great promises of advancement to the translator; but died without fulfilling them. 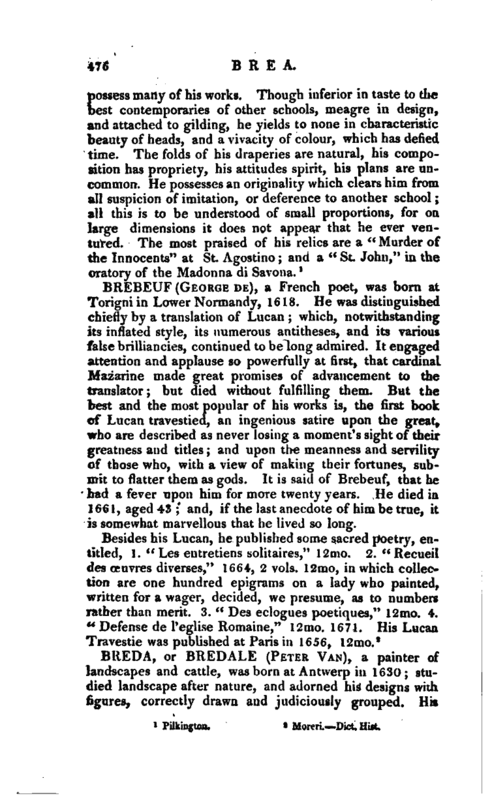 But the l>est and the most popular of his works is, the first book of Lucan travestied, an ingenious satire upon the great, who are described as never losing a moment’s sight of their greatness and titles; and upon the meanness and servility of those who, with a view of making their fortunes, submit to flatter them as gods. It is said of Brebeuf,. that he bad a fever upon him for more twenty years. He died in 1661, aged 4S; and, if the last anecdote of him be true, it is somewhat marvellous that he lived so long.